Add classic groove to your tracks - from the people who invented MIDI gates back in 1994! EXPRESSION (25), FILTER (8), MODULATION (3), PAN (7). MIDI gate effects are simply the simplest but coolest way to add instant 'groove' to your tracks. These rhythm templates can be applied to synth pads, vocal sounds, strings... anything with some sustain and timbral interest. 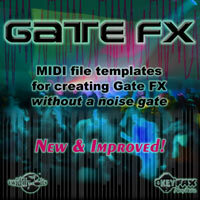 MIDI gates can be loaded into any DAW or any hardware sequencer that can import .MIDs. Assign a sound source, line up a MIDI channel, and hit play on your DAW. Notes or chords that you play will now be 'gate effected' and will create that magical rhythmic grooving that instantly makes your track sound like a hit. Mix and match gates, swap/add new sounds, the rhythmic permutations are literally endless.